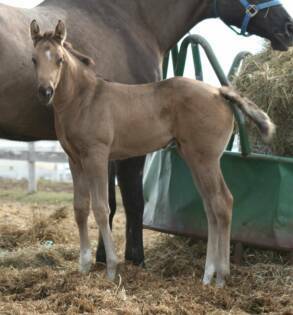 PLEASE, don't forget to email us with pics of your foals by THE MIDAS TOUCH KID. We'd love to post your photo. Ooooh la la!!! It's a PALOMINO FILLY at the Ammerman's !!! And WHAT a filly she is!!! Just look at that elegant neck, shoulder, short tight back, & the makings of a big hip with very pretty hocks. Her Dam is an amazing mare: Imagine Me Dancing ( 72 AQHA Halter pts) x Image of Kid. ~ A huge CONGRATS Stan, Brenda and Brooke! She's got a BIG Future ahead of her!! Watch for her at the Futurities and Palomino shows!!! Congratulations to Pete Reinhart on the birth of a GORGEOUS Palomino filly out of his Kids Second Clu/Obvious Prophet mare!! We are THRILLED for you!!!! Congratulations Mark and Deb Iserman on your NEW Golden addition!!! 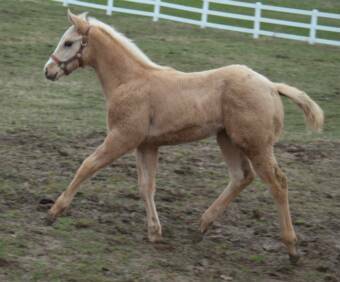 A Palomino Colt out of a daughter of their stallion, Poise N Tuff!!! Deb said she's very impressed and that the colt has THE most beautiful little refined head you could imagine. We can hardly wait to see pics!!!! It's a Baby Buckskin for Kim & Heath Larson!! 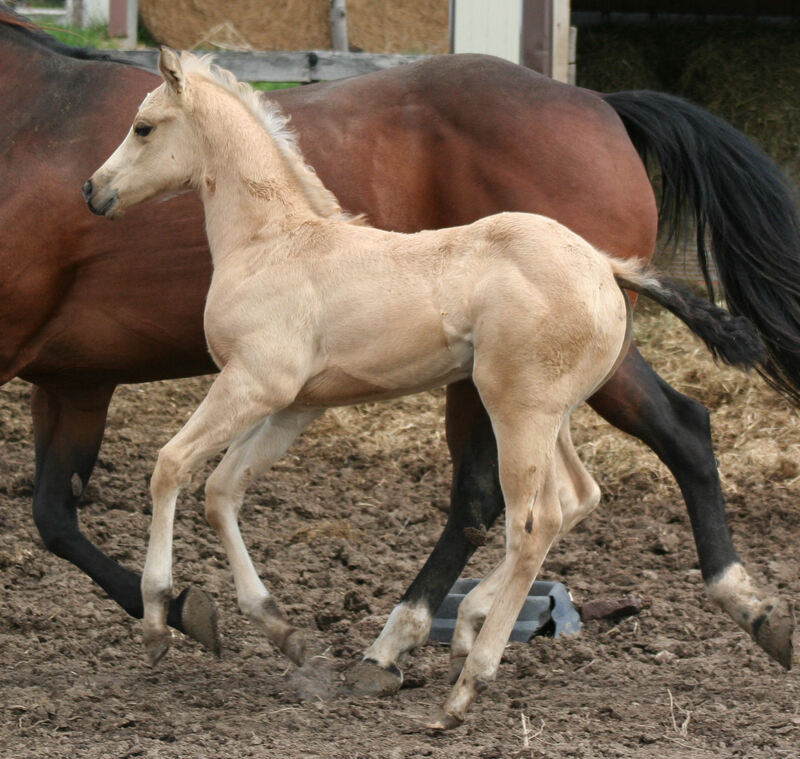 A Big, tall "Classy" Buckskin colt!! Sired by The Midas Touch Kid and out of a daughter of Zhip x Zips Chocolate Chip. This guy is going to have the build and the sweeeeeeet moves!! And it's easy to see why...She's EXQUISITE!! !...baby doll headed, loooong elegant neck, deep V'd muscular chest and forearms, short, tight back, big ol' hip and pretty hocks. She is Sired The Midas Touch Kid and out of a phenomenal producing daughter of Poise N Tuff ( Superior Halter/Perf, Supreme, All-Around and Mega Futurity Champion Sire x Impressive Poise ( World Champion Halter) What a PEDIGREE!! When she's done being shown, she has a STRONG, PROVEN broodmare line top and bottom. This is a Show Filly Extraordinaire!!! Classy, muscled with lots n lots of "pretty", balanced and the bonus is, she's a beautiful mover..so there are NO LIMITS on what this filly could do!!! Hypp NN. A MN and Iowa BREEDERS entry. Watch for her Futurities!!! And now the moment we've been waiting for....the arrival of "Belle"!!! 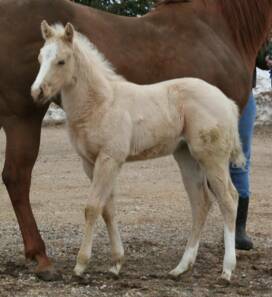 An extraoridinary Palomino APHA filly with the most beautiful refined head, a long elegant neck, short tight back long hip & the makings of a powerful chest, & very pretty hocks. And not only is "Belle" pretty to look at, but she's got the pedigree power behind her. Sired by THE MIDAS TOUCH KID and out of the Prestigious Iowa Paint Horse 3 year award winner~ Amazing Poisen (Poise N Tuff x daughter of Mr Fancy Bonanza, APHA Reserve World Champion Halter, Superior Halter and Superior Pleasure with 211 Halter pts, 116 Perf pts. Lifetime Leading Sire). Here's a filly with infinite potential! 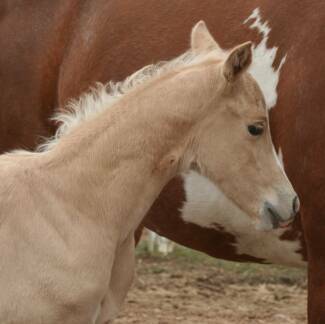 No spots ( that we can see so far), but Palomino ...and a filly so 2 outa 3 aint bad...:-) Show both APHA and Palomino. With her incredibile conformation, Golden color and soft, sweepy movement....She should be a powerful force in the halter pen and the performance arena. Hypp NN. MN Paint Horse Open Futurity nominated. Here she is!!! The filly that has existed in my dreams for years!!! 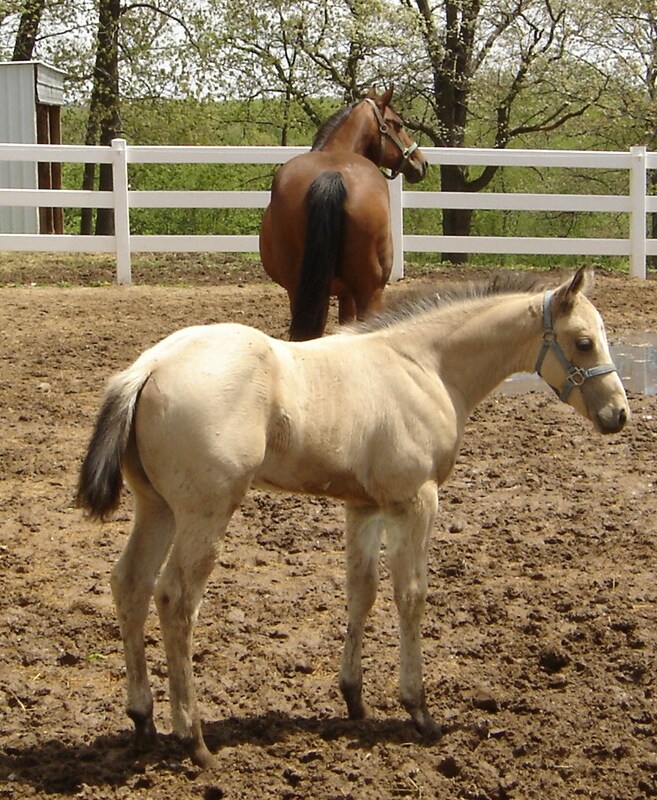 AQHA Smokey Grulla ( also carries the creme gene) filly. She is sired by The Midas Touch Kid and out of a 16.1 1/2h Grulla mare, Ima Cool Kinda Lady (Multiple IBHA/ABRA WORLD CHAMPION Mare and a MULTIPLE IBHA WORLD and CONGRESS CHAMPION Producer). 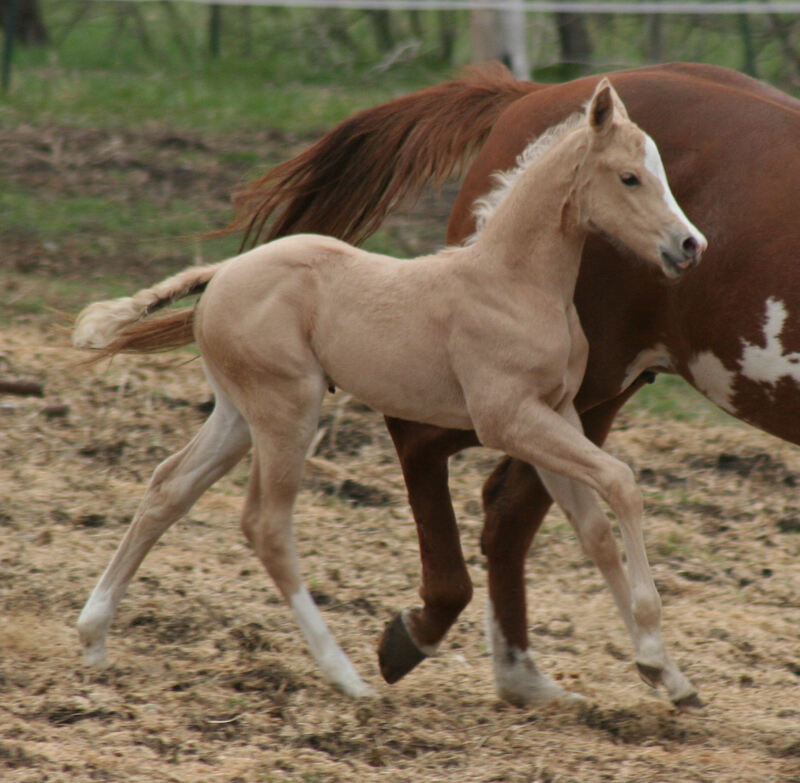 Her Dam is one of my most CHERISHED broodmares and this filly is a newborn version of her. Cute face, long pretty neck, short, tight back, deep V'd chest, Big Ol' HUGE hip and pretty hocks. And, just like her MANY Champion siblings, she should be heavily muscled with LOTS of "pretty"! We call her "Faith" for many reasons, but mostly because she is living proof of what happens when "you keep the Faith". Obviously, we will be keeping her to Show and eventually add to our breeding program. Incentive Fund, MN and Iowa Quarter horse eligible.